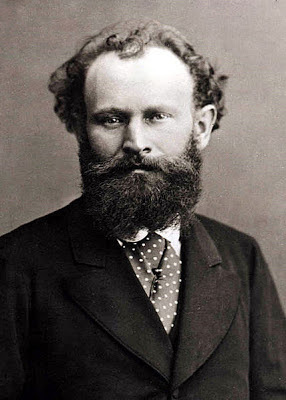 Portrait of Édouard Manet at 34 years of age. Photo: WikiMedia.org. 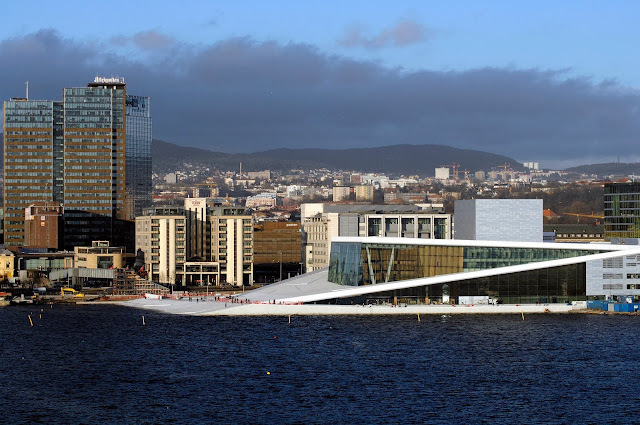 Welcome to the May installment of ArtSmart Roundtable! 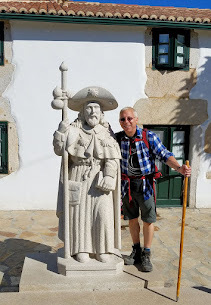 Each month, a company of travel blogger art aficionados highlight a particular focus in art and this month, we feature the "artist." While I was writing the March installment when we focused on art worth traveling for, two of my all-time favorite paintings by Manet were among those featured and so I thought I would explore the world of Manet in more depth and share some additional works that have established Manet as one of the pioneers of modernism. Born in 1832 in Paris, Édouard Manet paved the way for the modernism art movement in the mid-19th century and served as the catalyst for impressionism as well. Although the debut of his controversial painting "Déjeuner sur l'herbe" or "Luncheon on the Grass" in 1863 caused quite the commotion at the French Salon—an annual official art exhibition that often rejected unconventional works that expressed originality from artists of the day, he firmly established himself as the master of modernism, and while this painting was exhibited and sadly rejected by the his avant-garde approach to painting with vivid colors, bright-tones and unique perspectives of real life, he eventually earned the respect he deserved in the art community as you will you see. We're going to explore some of Manet's most famous pieces and those sometimes controversial subjects within. Manet's "Luncheon on the Grass" caused quite the scandal in 1863 when it marked his debut at the French Salon. Photo: WikiMedia.org. 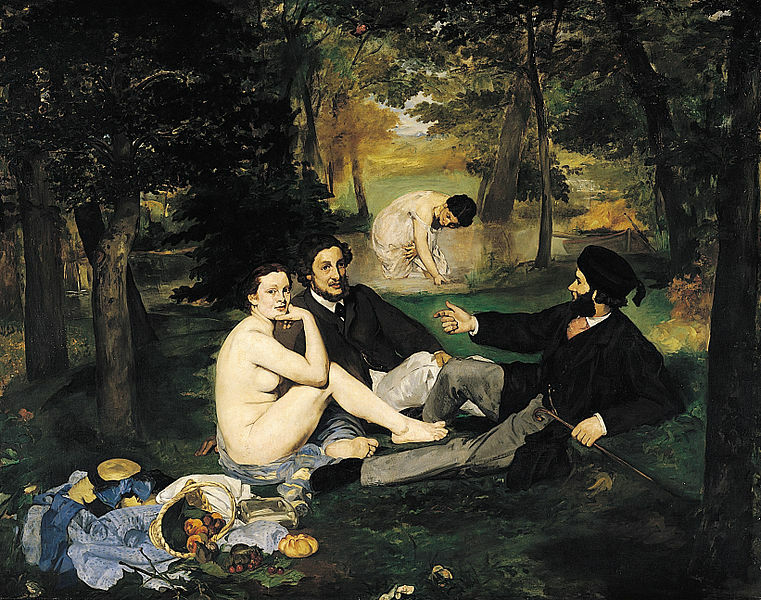 "Luncheon on the Grass" caused quite the scandal in 1863 when the 31-year-old Manet debuted his painting at the French Salon. Why the scandal? This unexpected scene portrayed Parisians in a Parisian setting behaving inappropriately with its main subject, a naked female seated on the ground with two well-dress gentlemen and a woman in a negligee bathing in the background. At the time, naked portraits were not expected as they were during the Renaissance from which this painting takes its inspiration. Despite Manet's use of color throughout this work, its main subjects comprise a black and white composition save the still life of the spilled-over picnic basket and our diaphanously attired woman in the background. It is believed that Manet "borrowed" the concept and subjects from two sources: one from Raphael's drawings and the other from "Pastoral Concert" painted by Giorgione 300 years earlier. Photo: WikiMedia.org. It is believed that Manet "borrowed," and I use that term loosely, the concept and even the subjects from two sources: one from Raphael's drawings and the other a painting by Giorgione 300 years earlier entitled "Pastoral Concert." 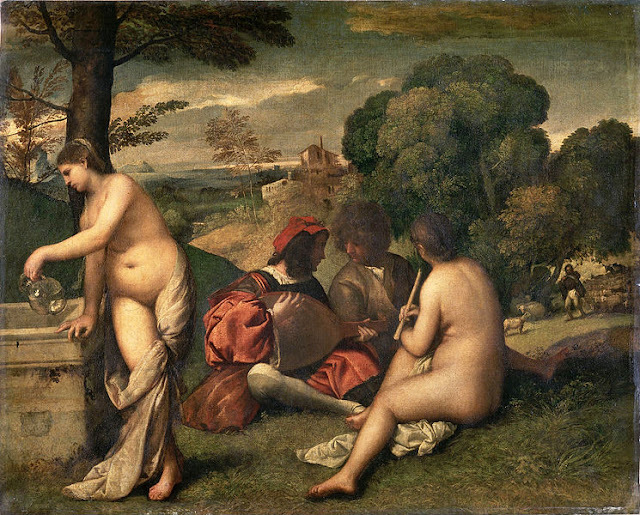 See above Giorgione for comparison. You can see "Luncheon on the Grass" at the Musée d'Orsay in Paris near the Louvre. Unlike "Luncheon on the Grass," "Olympia" was accepted into the French Salon in 1865. Photo: WikiMedia.org. Another masterpiece painted in the same year as "Luncheon" and thankfully not submitted to the French Salon until 1865, "Olympia" was ironically accepted, a testament to the changing times and acceptance of bold new ideas and groundbreaking styles that would come to define future art movements. Equally famous as "Luncheon on the Grass," this portrait of our French Olympia shows her in harsh lighting without a lot of modeling on her skin. As she reclines on her bed, her hand is firmly placed "protecting" herself from her gentlemen callers. Her repose communicates one of independence and dominance over her male callers. The woman at the right presents flowers but they are not for Olympia, they are for us—the gentlemen viewers of this painting so that we may present them to the lady. Note the black cat with arched back peering at the viewers or intruders into her mistress' world. A closer look at the striking similarities and differences of Manet's "Olympia" and Titian's "Venus of Urbino." Photo: WikiMedia.org. Once again, we find Manet "borrowing" his subjects from another well-known painting, Titian's "Venus of Urbino" on display at the Uffizi Gallery in Florence. Athough many similarities are apparent in the two paintings, the differences are just as significant. While Olympica is a prostitute, "Venus" is a courtisonne or a noble mistress but it is also believed that she is a newly-married bride representing the symbol of love. If you compare Olympia to Venus, you'll see some of differences including the position of the left hand. I mentioned Olympia above but notice how Venus' hand is shown in a state of modesty as opposed to the state of dominance. Also, instead of cat at the foot of the bed, we find a curled-up puppy sleeping softly. You'll find "Olympia" at the Musée d'Orsay as well. The separate worlds of "At the Cafe." Photo: WikiMedia.org. 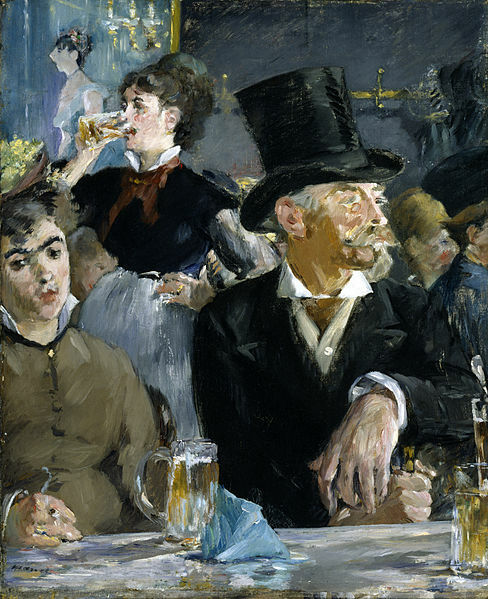 Painted in 1879, "At the Café," my all-time favorite Manet, takes place in the café concert, a popular form of entertainment at the time in which a cabaret was performed in a café serving refreshments. While we don't see the performance, we do get a sense of the disparate worlds from which these characters reside. The gentleman in the top hat is clearly not of the same social scene as the woman of lesser standing sitting beside him. To further contrast these different worlds, the barmaid knocks down beer directly behind our two leading characters while in the farthest plane of this painting, the reflection is that of the elegant cabaret performer. Manet's vibrant splashes of color contrast nicely with the predominant use of black and white. Note the exquisite portrait of our leading man from his top hat to his relaxed hand hanging over the end of his cane—testament to Manet's ability to portray unique "real-life" perspectives. You can see "At the Café" at the Walters Art Museum in Baltimore, Maryland. In 1880, Manet suffered from the onslaught of Locomotor ataxia which greatly diminished his work from his giant canvases that we have all come to know, to much smaller pieces concentrating mostly on pastel portraits and floral still lifes. Despite these afflictions of the disease, there was yet one more masterpiece, one of his most complex, within him thankfully, "Bar at the Folies-Bèrgères" painted between 1881 and 1882. We find the barmaid looking out from the painting but not directly at us. Behind her, the reflection of the balcony section of the theatre shows patrons peering through their opera glasses at the performance to our left. Look carefully in upper left corner and you will see the trapeze artist's legs extending into our field of view. This painting gets even more complex when you consider impossible perspective of the reflection of the barmaid's back and her gentleman caller. Our barmaid is actually the portrait of Suzon who worked at the Folies-Bèrgères during that time and was reputed to be a prostitute as evidenced by the glass dish of oranges placed in the foreground by Manet who often associated oranges with prostitutes in many of his works. You can find the "Bar at the Folies-Bèrgères" at the Courtauld Institute Galleries in London. 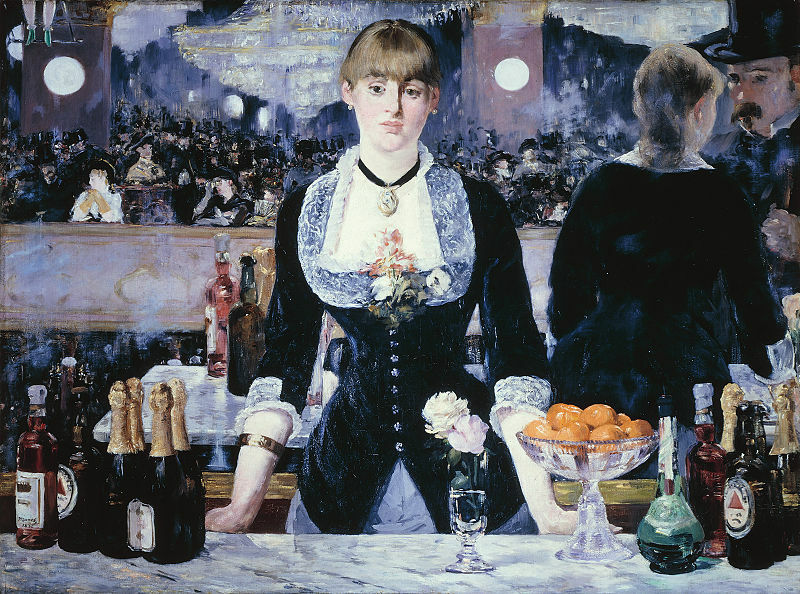 I hope you enjoyed this introduction to Manet, the master of modernism. Please share your thoughts, perceptions and other insights about Manet or modernism in the comments below. I would love to hear your perspective. Bar at Folies Bèrgères has been a favourite of mine within his work. Her empty expression and the angle of the work - are we the gentleman who she is looking past with tired eyes? Great choice for this month! I love Manet's work. Thanks so much Jenna for stopping by and sharing your kind words. I really appreciate it! Manet's Olympia changed the course of my life. I was standing before it as a teenager fresh out of high school, marvelling at how he had managed to portray her blue veins just below her white skin with nothing but paint. There and then I developed a passion for art and decided to pursue an art history degree. That's the power of art. There really is no substitute for seeing paintings in person, so get out there, people! HI there Lesley and thank you so much for stopping by! Wow, isn't it incredible how art inspires all of us in so many different ways? Thank you for sharing your sage advice with all of my readers! I really appreciate it! I enjoyed this brief art lesson very much! My favorites are the last two. 'At the Cafe' has such a Parisan feel to it. Thanks for sharing your love of art! Hi there Debbie and thanks so much for stopping by! I couldn't agree with you more about the last two...my absolute faves as well with "At the Cafe" ranking #1 in my book. It's exquisite! Great round up, Jeff! While this movement has never been a favorite, I liked that you showed the two inspirations for his earlier paintings. It gives the paintings more context to see what was done 300-400 years earlier and how technique and style progress. Hi there Erin and thank you so much for stopping by! It just goes to show you that the classics never die regardless the change the styles! 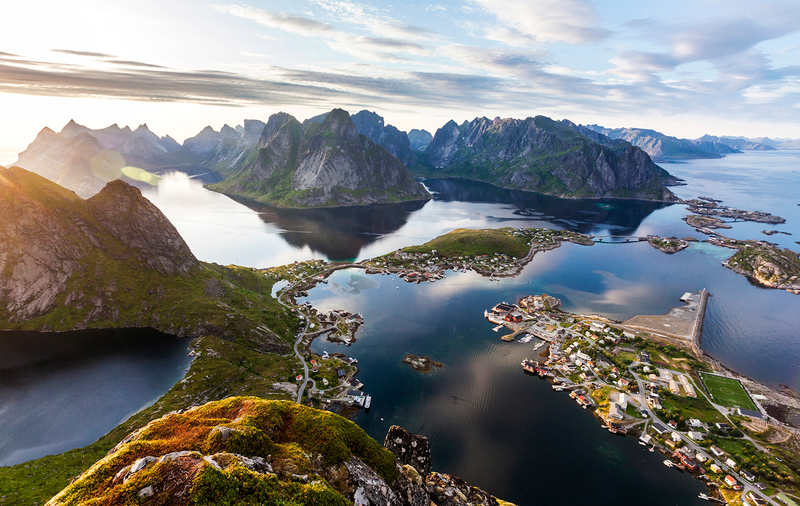 Hi there Lori and thank you so much for stopping by and sharing your art + travel experiences! Every time I visit a museum, I am captivated by all the new artists and my all-time faves that I encounter along my tour. So glad you had the chance to experience Manet too! Hi again and thanks so much for the link too! !